Our chocolate bunnies. 8 1/2 inches tall. Almost too cute to eat — almost. $9.99/each. Come and get ‘em. Our 420 Hippie Hemp Bread. A nutty, seedy, wheaty, hempy, free-spirited loaf. 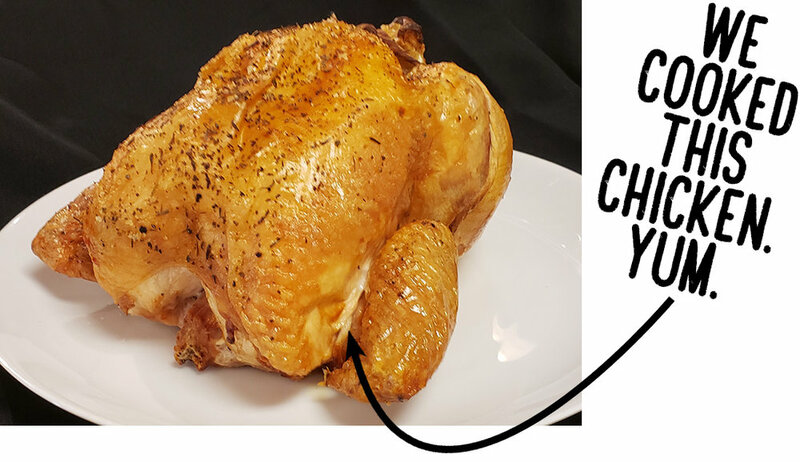 MARCZYK ROASTED CHICKENS: ORDER ONLINE! Order your fresh, whole, Miller Poultry chicken online by 11:00 weekdays. We’ll roast that bird and have it ready to pick up by 3:00, at whichever store you choose. These are big, cage-free, big, low-stress, big, hormone-free chickens. READY, SET, ORDER YOUR CHICKEN. Here are just a few of the hundreds of items we have in our Friends & Family program. Click on each item to the right of the images (below the images on mobile) to read all about them. Not a Friends and Family member? Go right here to sign up. It takes less than a minute. They’re local, and they’re not only free-range, they’re pasture-raised. CLICK ON EACH ITEM TO LEARN MORE. AND MAYBE TO LEARN A NEW JOKE. YOU NEVER KNOW. Now there are Butter Crunch cookies from Tate's. If the buttery, toffee-y, burnt sugary taste of these cookies doesn't make you want to eat the whole bag in one sitting, then we're plum out of ideas on how to get you to eat a whole bag of cookies. We also now have Gluten-Free Oatmeal Raisin and Walnut Chocolate Chip. BONUS JOKE: Did you hear about the mathematician who’s afraid of negative numbers? The chickens that lay these eggs are free to roam around on 6 acres of grassy pasture where they can eat bugs and have so much room for activities. Amish Acres is a family farm that uses no antibiotics or hormones and feeds their chickens GMO-free feed only at night when they're inside insulated from predators; otherwise they're outside doing chickeny things according to their job descriptions. BONUS JOKE: Yesterday I saw a guy spill all his Scrabble letters on the road. I asked him, "What’s the word on the street?" Based on the naming conventions of these cheeses, we're thinking that the cheesemakers may have somehow somnambulated their collective subconsciouses back to the sixties. Not that that's a bad thing. Regardless, these cheeses are ready for you to fall in love with them, which you will. PsycheDillic: Since you love dill, this one's for you — a surprising depth of flavor with a tart and bright finish. Made with dill and dill pollen. We thought dill pollen was the stuff of science fiction, but no. Purple Haze: Subtly sweet with the tangy brightness of fresh goat cheese. The distinct and unexpected marriage of lavender and hand-harvested wild fennel pollen makes Purple Haze happily addictive. Sgt. Pepper: A fresh goat cheese with a combination of four peppers, exotic spices, and pepper threads. The result is a complex taste experience — with a slight heat kick to the taste buds. BONUS JOKE: What do you call a goat with one ear? That's right, we make it ourselves. It is sublime on a homemade pizza; you can add it to salads; you can put some atop slices of baguette along with tomatoes, olive oil and sea salt; add a slice to a sandwich; you can use a ball of it for a hacky sack. It's very versatile, very fresh, and very delicious. Our market-pick brie is surrounded by an edible white rind and can be eaten at room temperature or heated; eaten by itself or with jams, marmalades and berries; added to a sandwich; prepared en croute; used as an impromptu discus. And this is such a wicked-good deal on a brie that you should probably get some and then, two hours later, after you've eaten the one you bought two hours ago, you should get another. BONUS JOKE: Q: What did one plate whisper to the other plate? A: Dinner is on me. Roasted for us at 8,000 feet by Vail Mountain Coffee & Tea. They are robust and not bitter and are quite frankly some of the best-tasting coffees you'll come across. Potent, rousing & vigorous. A blend of dark-roasted South American & Indonesian beans — robust & earthy with a touch of brightness at the end. Ripe, opulent & romantic. An exotic blend of lightly roasted East African coffees provides a bright mouth feel and flavors of citrus and berries. Rich, velvety & smooth. A blend of rich Indonesian coffees roasted medium-dark (Vienna roast) — full-bodied and velvety smooth with very low acidity. Radiant, vivacious & bright. This is a good one to start your day: Lightly roasted beans from Central America and Indonesia. And a lighter roast means more caffeine. Sultry, scintillating & brilliant. Nicaraguan beans give an aroma of dry autumn fruits with hints of blackberry and apricot. Ethiopian beans highlight the fruit by adding hints of melon and blueberry. Egads! Zoinks! It's spring! Is spring a soup season? You better believe it. With our homemade soups, every season is a soup season. We have some tasty things to show and say on Instagram.